I-chèle is an award-winning reggae artist currently living in Portland, OR. She is produced by the reggae legend Vince Black, and blends reggae, rock, and soul into a style all her own. Intoxicating vocals woven around deep drum and bass rhythms; this is the essence of I-chèle & The Circle of Light. With a sensuous, passionate flair, I-chèle creates her own blend of reggae, highly influenced by Bob Marley, Jimi Hendrix, and Sade (just to name a few). Her positive and up-lifting message shows respect for the power of roots rock reggae and the nyabingi rhythms, and her presence captivates audiences of all ages. I-chèle grew up in New York City and was trained in theater and dance at the NYC School of Performing Arts. She traveled the world before settling down on the West Coast, where she has grown a steady fan base. Her music is aired on community radio stations all over the United States and South America. 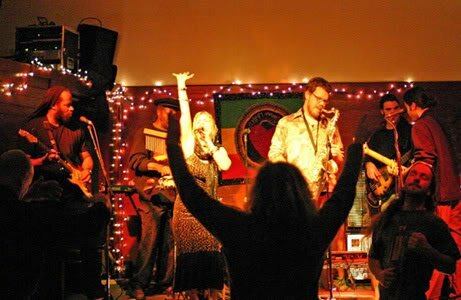 The Circle of Light is comprised of some of the Northwest's best musicians, and was the backing band for the Northwest Showcase at the 2006 NW World Reggae Festival. I-chèle & The Circle of Light have released their newest album, "Salon De Esoterica (Liquid Love)," which was produced by reggae legend Vince Black. Black has played guitar for many legendary groups, including Black Uhuru, Wailing Souls, Dennis Brown, Prezident Brown, Sister Carol, Dub Syndicate, Andrew Tosh, and many more, and can also often be seen performing on stage with I-chèle.